Romanticism was a cultural movement that started in Europe. It was somewhat of a reaction to the Industrial Revolution which occurred during the same time period. The movement affected philosophical thinking, literature, music, and art. When was the Romantic style of art popular? The Romantic Movement started at the end of the 1700's and reached its peak in the early 1800s. It marked the end of the Baroque movement and was followed by Realism. What are the characteristics of Romantic art? Romantic art focused on emotions, feelings, and moods of all kinds including spirituality, imagination, mystery, and fervor. The subject matter varied widely including landscapes, religion, revolution, and peaceful beauty. The brushwork for romantic art became looser and less precise. The great Romantic artist Caspar David Friedrich summed up Romanticism saying "the artist's feeling is his law". 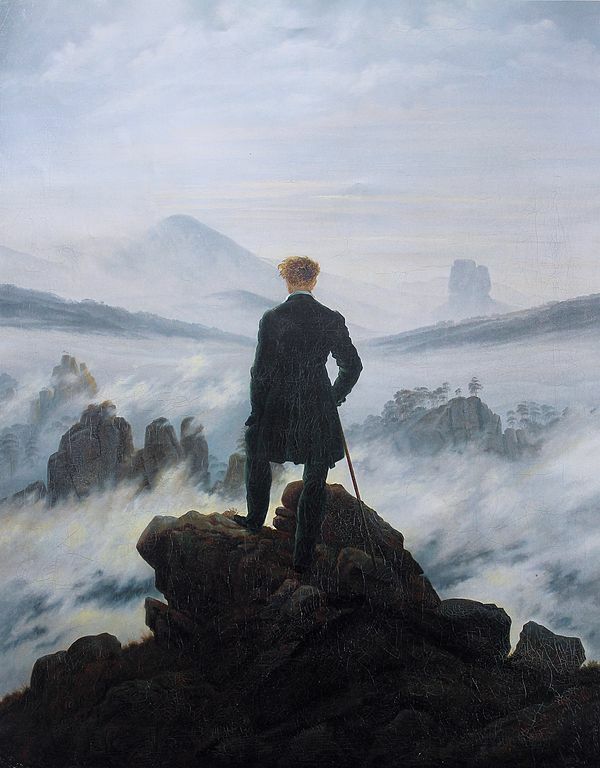 Perhaps no painting represents the Romanticism movement better than Friedrich's The Wanderer. In this picture a man stands at the peak of a rocky precipice, his back to the viewer as he looks out over the clouds and the world. The viewer experiences the awe of nature and at the same time feels the insignificance of man. The painting does an excellent job of conveying the emotion of a moment and the drama of nature. The Third of May 1808 shows a different side of the Romantic artist, the side of revolution. 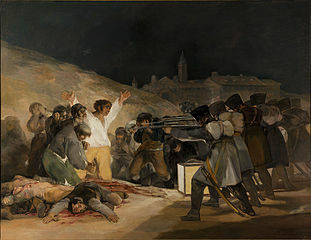 In this painting Francisco Goya is commemorating the Spanish resistance to France and the armies of Napoleon. This painting has movement, drama, and emotion typical of the Romantic Era. It is also one of the first paintings used to protest the horrors of war. In this painting you can see the sense of the fantastic. The Titans were from Greek Mythology. They were giants who ruled before the Greek gods like Zeus. The shear size of the goblet gives you an idea as to how enormous the Titan's must have been. Details in the painting, such as the boats sailing inside the goblet and the buildings on the rim of the goblet, add to the feeling of grandeur. William Blake - An English Romantic painter who was also a philosopher and poet. Thomas Cole - An American artist famous for his landscapes and also for founding the Hudson River School art movement. John Constable - An English Romantic painter known for his paintings of the English countryside. Eugene Delacroix - The foremost French Romantic painter, Delacroix's paintings often depicted scenes of drama and war. Perhaps his most famous painting is Liberty Leading the People. Caspar David Friedrich - A German artist who painted sublime landscapes which often showed the power of nature. Henry Fuseli - An English romantic painter who liked to paint the supernatural. His most famous painting is The Nightmare. Thomas Gainsborough - A Romantic portrait artist famous for his painting Blue Boy. Francisco Goya - A Spanish artist who became known for his dark artwork as well as his protests of war. J.M.W. Turner - An English landscape artist who used sweeping brushstrokes to express the emotions and power of nature. It was one of the first times in the history of art that landscapes became a significant subject for painting. Another art movement took place at the same time called Neoclassicism. Neoclassicism was very different and focused on moral purpose, reason, and discipline. Romantic literature includes the works of Edgar Allen Poe, Ralph Waldo Emerson, William Wordsworth, John Keats, and Nathanial Hawthorne.